When it comes to crayons there is one brand that immediately comes to everyone’s mind (right before “and Roseart? Is that their name?”): Crayola. They’ve been making crayons for more than a century, and seem to really know what they’re doing. Their products are pretty close to ideal for school use, and can be used, in good hands, to even make fine quality art. They’re simple and sturdy, with just a traditional paper wrapper that is almost instantly recognizable to anyone who was raised in the United States. They’re harder to make a mess with than markers and easier to use than colored pencils. Still, they don’t lend themselves well to more advanced techniques, like any type of blending really. 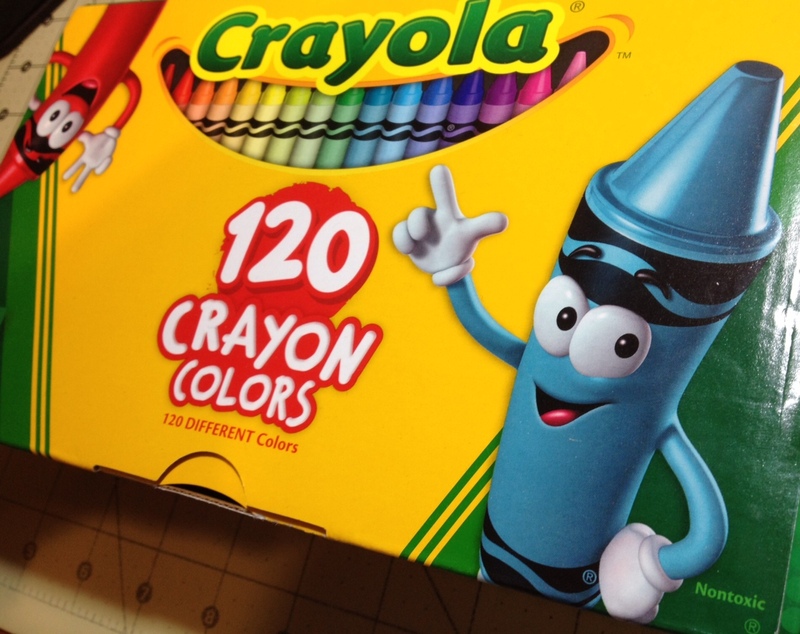 But to solve that, Crayola has a (relatively inexpensive) box of their 120 “standard” colors (excluding metallic, sparkling, and retired colors) available to give you as many different shades as you need. I roughly organized this set and split it into 4 parts of 30 crayons each (now combined), where I will go through and evaluate each color (with the included sharpener) and whether or not getting the 120 is really that much better and the 64 or 96. White – White is white, and on white paper, virtually invisible. There isn’t much of an off-white look either; it really does look like white paper on another color. It’s probably everyone’s least used crayon, but it’s good for highlighting, and covering an entire page without being able to see what your doing. Piggy Pink – And very quickly we get to one I’m not really a fan of. Piggy Pink is a next-to-impossible-to-see color that, based on all of my observations, might actually be a pink hue. Maybe it’s for highlighting, but how often do you see that with crayons? I think it’s close to useless. Salmon – Next up is a Salmon, which does look like the fish, though darker. Like most of the pinks it doesn’t cover well and is quite pale, but its still a pleasant color that could find a variety of uses. Shocking Pink – Shocking pink is one of those fluorescent colors. It is easily the brightest pink and since the set has no “hot pink” it is a suitable replacement. It’s good for coloring 80’s clothing and aliens, but I suspect some could find more creative uses for it. Radical Red – The name of this one is a bit of a swap, I think. It’s not really a red, much more of a pink (even with pink being weird as far as the light our eyes see and everything). I would best describe it as a darker, and more subdued, version of hot pink. Think the 90’s version of Shocking Pink up there, with much the same uses. Wild Watermelon – Wild watermelon is quite an apt name for this one: it does look like a ripe (perhaps a bit overly so) watermelon. It’s a bright spring or flower color that unfortunately doesn’t cover well and has limited use. Razzle Dazzle Rose – A color very similar to shocking pink, but with slightly different coverage properties (less even, but darker in spots). It is a bit darker and does give off a hint of the classic rose color, but it isn’t very spectacular. Carnation Pink – This pink does resemble a carnation, but of course flowers range hugely in colors. It is a good flower color and covers well, but it’s too light to have many other applications. Pink Flamingo – Despite the name being slightly misleading (it doesn’t really look like a flamingo, it’s quite a bit darker) this is one of my favorite pinks. It has a nice easy-to-see color, that covers alright, and has a versatile (for pink) range, from flowers, to berries, and even flamingo shading. Tickle Me Pink – Lacking any knowledge about what color “Tickle Me” is I will say that this pink is a very similar one to the Pink Flamingo, it covers better and is a more “blueish” color. Filling many of the same roles, but being just a hint different. Cotton Candy – Cotton Candy is one of the last “It is really hard to see this” colors we’ll have for a while (until lavender, and then not until yellows) but by virtue of it being one of those I am not a fan. It does cover surprisingly well, but it isn’t the color of cotton candy (at least what I’ve eaten) nor much else. Mauvelous – Mauvelous is a wonderful pun and a nice-looking color. It isn’t the best covering one, but it is a light, purple-ish pink that is nice too look at. The one problem though is that the color isn’t mauve. It might be in the same realm (as in purple) but it wouldn’t have nearly the same uses. Scarlet – Scarlet has always been one of my favorite colors. It’s a nice very bright red that looks good in highlighting, flowers, and anything that is generally a red color. It doesn’t cover as well as some of the other colors unfortunately. But it does draw the eyes while not being too overbearing. Brick Red – Another apt name, this color is very much like a new brick wall with perhaps a dash of purple. It works for brick, obviously, and some older red items, like old fire hydrants and the like. Like most reds it’s all right in coverage, but lets the white show through here and there. Razzmatazz – If I had to tell you what a Razzmatazz was, I wouldn’t be able to. I might guess that it would be a similar color to a raspberry, which this color is. It is also very much unlike Razzle Dazzle Pink, being a fairly dark pink/purple-y red that covers well enough. It’s good for berries and flowers and such, but I couldn’t pick it out in a lineup. Red – A classic color there really isn’t much to say about. With coverage being much smoother than all of the pinks or pink-likes, and a pigment suitable for fire trucks, or apples it is an indespenable one. Pink Sherbert – An interesting spelling choice on this one, but an apt description. This color would be very usable for frozen fruity treats. It is darker and covers better than most of the pinks and is quite soothing and cool looking. Wild Strawberry – Wild Strawberry does look like a wild berry, but I’m not sure a strawberry would be the one I’d pick. It is a bit more purple/blue than most strawberries I’ve seen, but perhaps that’s just because I haven’t seen them in the wild. It is a nice raspberry or grape color as well, but like most reds it lacks good coverage. Violet Red – This color is very hard to differentiate from the previous wild strawberry. It’s a little lighter, and a little more purple, but it has much the same use and properties. Maroon – Maroon is one of my favorite colors in general, but it is generally a redish-brown-purple. And this version is distinctly less brown than is typical. I’d almost call Brick Red a more standard maroon color. It’s still a very nice, deep, satisfying color here, that gives the best coverage out of any of the reds. Unfortunately its uses are limited to shading, bruises, some clothing, and Texas A&M paraphernalia. Cerise – Another color I am mostly unfamiliar with, but the name is quite accurate here. A purplish red, cerise doesn’t have many uses, save berries again. But it is a pleasant, lighter color that covers decently when applied. Jazzberry Jam – Crayola seem to really like adding “z’s” to their color names, a theme that another color will follow before we’re through this first part. Jazzberry Jam is a lighter purplish-red and is indeed like many types of jams, jellies and berries. It’s got good coverage and is nice on the eyes. Blush – Another good color name, Blush is exactly what I would have expected this color to be, or at least one of the variations. It’s a medium tone red-purple that covers very well and could be used as an actual blush color, unfortunately, despite it being nice looking, there isn’t much else to do with it. Lavender – A fairly accurate representation of the flower, lavender is a light purple that is one of the more difficult crayons to see, and doesn’t cover very well, but is also one of the most interesting to look at. Not much to use it for, though. Hot Magenta – This color is very similar to Razzle Dazzle Rose, with a dash more purple and some of the “atomic” glow taken out. I’m not a fan, and it doesn’t cover well, but it is seeable and not too hard on the eyes. Purple Pizzazz – The final of the various “azz” colors, Purple Pizzazz is pretty unspectacular. It’s a light purple suitable for light purple things that covers all right. It’ll get use as an in-between color, but I can’t see reaching for it that often. Magenta – Taking time off from Blues Clues magenta makes a good showing here. It covers well, looks very much like magenta, and because of that is nice too look at. Other than again flowers, berries, and the character, I’m not sure where it would be used, though. Fuchsia – The hardest to spell color is also one of the hardest for people to pin down what exactly makes it (like chartreuse). Fortunately to that end it is a flower, and this color isn’t quite like the examples of the flower I’ve seen. But it would still work for other flowers and has good properties. Red Violet – Another good color name, it is basically purple with a bit more red mixed in. Getting into these true purples though, means fewer and fewer uses, but better coverage, which this one has. Egg Plant – And finally for this first part one of my (and certainly my mother’s) favorite colors (really just because it’s a goofy name) eggplant looks a lot like an eggplant. And it covers well enough that if you wanted to color an eggplant or shade some other purple color it would work perfectly. Plum – Plum is a nice, deep purple that evokes the fruit to an extent. It is a bit less red than the plums I’ve typically seen, and it isn’t as dark as others, but it is a recognizable version, suitable for royal robes and flowers, that covers quite nicely. Vivid Violet – I’m not sure what makes this violet any more “vivid” than the others, but it is a nice, decent covering color, that is very similar to “plum” and has a similar enough use range to even be used as a highlighting color. Violet (Purple) – It seems strange to me to have two names for this color and only this color, but it is a classic. It covers decently and is the classic purple color, suitable for most purple applications (not skin, as I learned when I was in kindergarten). Orchid – As a type of flower that has many color variations, I would say that at least this color is similar to parts of various orchid flowers. It is a redish-blue-purple, if that makes sense. It’s lighter than other purples, but with streaks of blue seeming to come through and making the whole thing a cool, nice color suitable for use in most flowers. Wisteria – Much more on the nose, wisteria does capture a much better picture of the flower it is emulating, as well as crayon could do. The color is a gentle light purple with visible streaks of blue running though it. It captures almost perfectly the look of many wisteria flowers, but unfortunately, even though it covers well, it wouldn’t be used for much else. Purple Mountains Majesty – This crayon color may win my award for least favorite name. I have no idea what “purple mountains majesty” even is really, or how it would be represented in color form. I guess this would be it, and it is a pale, lilac-esque purple with alright coverage. I couldn’t think of an real uses beyond flowers, even mountains in the distance are typically different purple shades, but this could work. Blue Violet – Is essentially a bluer version of red violet, or, I suppose more accurately, a bluer version of the regular violet color. It very much feels like the color with more blue added, making it darker and cooler. It’s fine at covering but has what appear to be streaks of darker and lighter color running though it, making it a very interesting color to look at, but not one with many uses. Purple Heart – Doesn’t particularly look like the badge. But it is a nice dark-ish purple color. It’s quite on the blue side, making it very pleasant to look at but, like many, difficult to find a place to use. It also covers about as well as most other purples. Royal Purple – The last true purple on the list, Royal Purple doesn’t disappoint. It’s a nice, deep, fairly well-covering purple, that I would take over the standard violet most any day. Sadly, its uses might be regulated to the adornment of Kings and Queens. Outer Space – An interesting and close to-apt-color name. “Outer Space” is really a dark blue, a little darker and blacker than Prussian Blue. It has a black and purple space-like quality to it, and it covers well enough to be a good night sky. Most other uses would simply be a Prussian replacement. Midnight Blue – I’m not quite sure, but I think this would have been a more apt name for “outer space”. As it stands, it is a nice blue, and a dark one, but it isn’t very dark, and certainly not a midnight-y color. I do like it, it covers pretty well and it looks like a nice denim color (a color that will be coming up soon) and it would have a wide variety of uses since it is so close to the color of jeans. Navy Blue – I’ve seen better navy blues than this one, but it is pretty apt. It’s a darker, but less saturated blue. It doesn’t quite evoke the standard navy “deep sea” color, but it does a pretty good job for a crayon. It covers sporadically and seems to have stripes of lighter and darker color. Still it would make a good color for jeans, flowers, and water from pools to oceans. Indigo – This color looks quite strange. In comparison to the other colors here this one seems to jump off of the page; it’s almost watercolor-like. 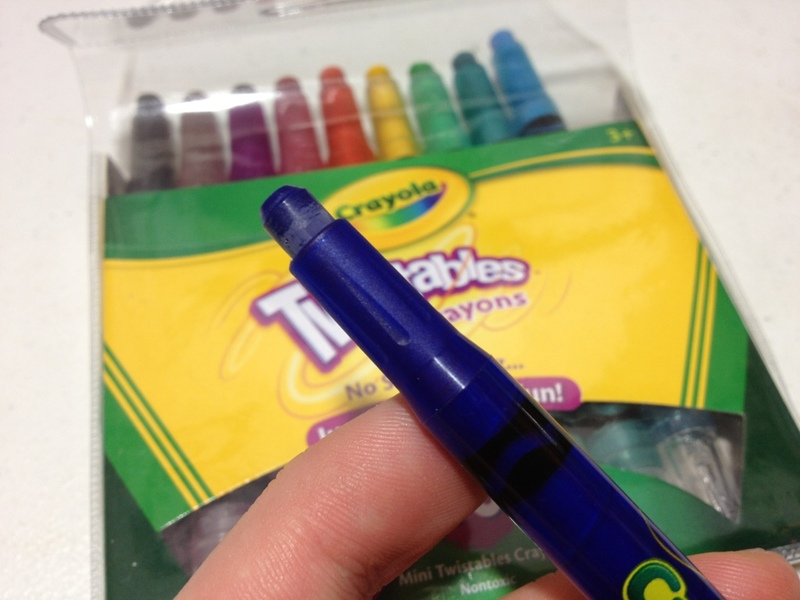 It is a very smooth, well, indigo color, but it tends to have spots where the crayon stopped moving. It covers well, and is quite dark, lending it to lots of uses from flowers to bodies of water. Denim – Denim is a very good name for this color. It looks like a pair of raw, unworn denim jeans. It covers well, and has a similar paint-like effect to “indigo”. It is not only perfect for jeans, but it could also easily match the basic dark blue color that many vehicles come in. Blue – Another classic color, the blue here is pretty standard, though I suppose that’s to be expected from the color that basically set what ‘blue’ is for the world of elementary school. The color is nice, middle-of-the-road, and it covers well enough (though probably the worst out of the blues). It works well for anything from shirts to oceans to cartoon dogs. Cerulean – Cerulean is one of the few colors that isn’t named after anything in particular (not even a town in Pokemon). Here it is depiceted as a thick, light blue, like the color of a Caribbean sea (or those pictures of clear freshwater lakes). 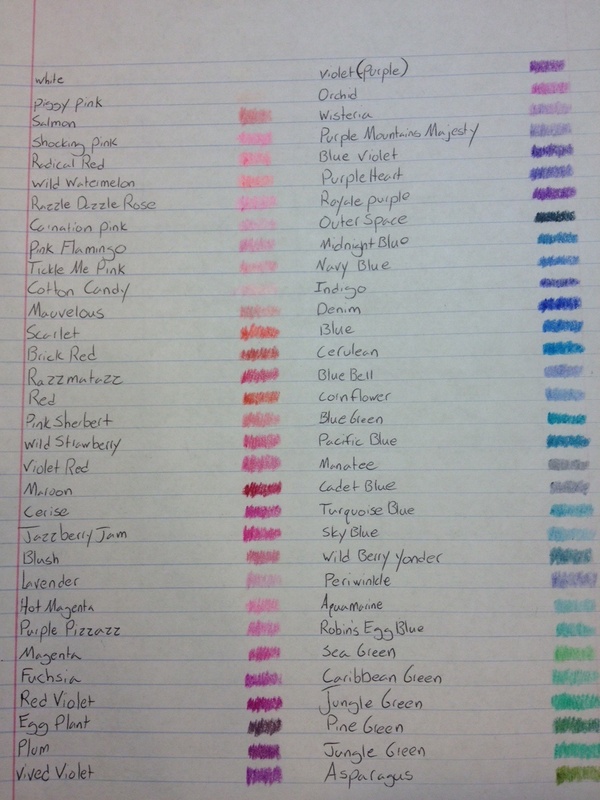 It covers very well and is a great color to use in a situation where you want the blue to “pop” off the page. Blue Bell – I’m not sure if this really qualifies as an ice cream color, but I’d like to think it is. Blue Bell is a nice, gentle, well-covering blue with a hint of a darker purple. It’s a good color for skies, clouds, mountain ranges, and foaming water. Cornflower – I don’t think this color replicates its namesake as well as it could, but the radiance flowers display is hard to replicate. This is a light, well-covering blue that leans to the white side of things, making it good for skies, clouds, and of course, cornflowers. Blue Green – A fitting, name, if not the best descriptor, “Blue Green” is a slightly greenish blue, as opposed to a bluish green suggested by the name. It’s a nice sea and tropical color, the kind that many summer items are made of. It covers decently but is a bit splotchy. Pacific Blue – Having recently visited the Pacific Ocean, I can say that this is not the color I saw there. But the color of the ocean changes by the season, and this color fits the bill. It covers well enough, with only small granules of white space. And its darkish/slightly stormy look makes it perfect for oceans both in the summer and fall, as well as the stormy sky. Manatee – The best way to describe this color is grey, with a blue tinge. It does resemble the skin of the animal, but not too a tee. It covers quite well, and is a fairly unintrusive hue. It can easily find a use for animals such as rhinos, elephants, and of course manatees; as well as sidewalk and swimming pool pavement. Cadet Blue – Besides reminding me of a Modest Mouse song, “cadet blue” is a good color. It is quite grey, but not as grey as the previous manatee. It’s got a little more blue in it that shines though just enough. It covers very well, but has a bit of a splotchy-fibrous look to it. It would work great for a cadet’s uniform, faded jeans, or sea creatures. Turquoise Blue – I don’t know why Crayola took their opportunity to create a turquoise and made it “turquoise blue”. It seems a bit of a waste, but it does look like a bluer, lighter version of the stone. It covers well, but it isn’t that spectacular. It would work for coloring turquoise-like stones, jade-like stones, greenish bodies of water, and clothing. Sky Blue – Another very good color name, this blue is indeed a very close approximation of the color of the sky (or at least what color it looks like it is). It’s pretty much the stereotypical light blue color people think of as sky blue (very similar to Crayola’s other sky blue in pencil form). It covers well enough (and the non-covered areas blend in easily since it’s so light) and it would work well to color water in dishes, fighter jets, babies’ clothes, and of course the sky. Wild Berry Yonder – An interesting take on a color name “wild berry over there” is only slightly better than “purple mountains majesty” in being a bad name. And I wouldn’t imagine the color this name represented being blue, but it is. A muddy sky blue as I would call it, it is a blue that has had grey rather than pure white mixed in. It does cover decently and would work for coloring dirty jeans, muddy water, or a dusty sky. Periwinkle – Another one of those flower colors that because of the varying nature of flowers is unable to be 100% accurate, “periwinkle” is also a standard color, which the crayon does not deviate from. It’s a light blue with a touch of purple and yellow (which doesn’t really make sense but sure). It doesn’t cover as well as other blues but it works, and it’s a good ice, cloud, clothing, or flower color. Aquamarine – Another nice blue color that covers very well. “Aquamarine” is a slightly green blue that looks like a warm tropical ocean or lake. It’s light and smooth in texture, giving it a pleasant look. It’s another fun summer color but unfortunately it doesn’t have many uses. Robin’s Egg Blue – Looking like a slightly darker shade of the last color, this one is indeed very similar to the eggs of a robin (again, allowing for natural variation). It’s another well-covering, very pleasant looking, somewhat useless color. It is vibrant and wants to jump off the page, but it also looks more oily, like a pastel if that’s what you want. Sea Green – While it might look like some sea, “sea green” does not represent a sea I would want to go near. This bluish green (or greenish blue, it’s kinda blurring the line) covers pretty good, but is lighter and harder to see (no pun intended). It works well for underwater foliage, plants in direct sunlight, and limes. Caribbean Green – A similar motif, but not quite the same style, “Caribbean green” is slightly more blue than “sea green”, looking like a slightly greener and darker “aquamarine”. It’s a good water color, but its coverage isn’t as much as some of the others in this set. It would work well for underwater plants and tropical bodies of water. Jungle Green – Starting off, “jungle green” is what I can only describe as a “wet” green color. It’s not really blue-ish, but it just seems damp. The coverage is good, as most of the greens will turn out to be, but I’m just not sure how useful it would be for anything other than those weird sea-green shorts. Pine Green – A theme with this first section of greens is going to be my wonder at why they were named that, and this continues the trend. While it is the color of some evergreens, I wouldn’t say this slightly-blue dark green represents pines. It covers kinda splotchy, but does make a good forest tree color, especially in the winter. Jungle Green (Shamrock) – Now here’s going to be a little problem in this review; there is supposed to be another color called “shamrock” here, but instead I received a second “jungle green”. I do understand that this sort of thing is bound to happen, but I am a little disappointed and I hope it isn’t a common occurrence. Asparagus – An unpleasant, yucky looking green that does indeed resemble some shades of asparagus (though not any I would be eating). It covers well enough and has much more shading ability than the majority of other colors in the set. Unfortunately its uses are quite limited and not on the nice side: like swamp yuck or vomit. Tropical Rain Forest – Looking a little too blue for its namesake, Tropical Rain Forest is a deep aqua color. It covers fine and is a nice shading… well… shade. In tandem with other colors it works very well but little vegetation or really anything is around that will use it as a primary color. Mountain Meadow – An oddly specific name for a rather plain looking green. Mountain Meadow is a slightly lighter and bluer color than regular “green”. It covers well in the normal range and has pretty standard green applications, though there aren’t any specific applications I can think of. It is a pleasant looking addition that adds some nice variation in shades (tints). Forest Green – A color name that, along with “hunter green”, always confused me. This vaguely evergreen or dying-plant color covers poorly for a green and shades a little more than usual. While it isn’t a color that would be unused in the forest, it isn’t a usual main one and would be most at home coloring evergreens or parts of hunter’s vests. Green – One of the standard 8 Crayola colors, Green is a very recognizable color with good properties. It’s nicely situated near the middle of the green spectrum and is suitable for all one’s foliage needs as well as for almost anything “green” made by humans. It covers quite well but has more pronounced darker spots than other colors in the area. Fern – Vaguely fern-like, this pale green does a decent job of covering and highlights or lighter spots on plants. If I had been consulted I would’ve called it more of a “mint” myself, or “green army from Risk”. Olive Green – Quite olive-colored (the green kind at least), and not really similar to military uniforms, I feel like Olive Green has a bit of a singular purpose. It isn’t the best at coverage and other than green-olives and pickles it looks a bit yucky. Granny Smith Apple – Slightly darker in my experience than its namesake, Granny Smith Apple does resemble the famous apple skin and is a nice color to use in other plants or un-ripe fruits. It doesn’t provide the greatest coverage (being rather stipple-y) and will likely need a “support” color. Screamin’ Green – And interesting name for a poor color, this neon lime green is an eyesore and not too great at coverage. Its uses would be limited to coloring neon signs, what one would write on black paper to make it “radical”, and perhaps radioactive waste. But I guess that’s more from a realistic perspective. Kids do like their neon. Yellow Green – Much more green than yellow, Yellow Green is a light vomit-esque green color that covers decently but isn’t that pleasant to look at, though in the right light it could be the color of unripe fruit or changing leaves. Electric Lime – The other neon green, Electric Lime is almost invisible on the paper and has very poor coverage. This is one where darker paper would be necessary and also the only use I could find for such a color. Inchworm – Similar to Inchworms from children’s books, but not those from real life, this color covers well but has a bit of shading to go along with it. It could be used as a green highlight, for changing fruit or leaf colors, or, less pleasantly, for swamp muck in summer. Spring Green – Another nearly invisible color that is much easier on the eyes. It is a vaguely green yellow that I could also call “autumn green” as it looks like grasses as they yellow in the fall or come back in the early spring. When colored in, it covers fine enough but has the consistency of grass and the green and yellow separate a bit. Green yellow – An aptly named green-tinged yellow; Green Yellow is quite light and hard to see. It covers fairly well but with subtle shading that is hard to see at first. It is a good green highlight color, a likeness for grass turning yellow in the fall, and the color of some pears or apples. Canary – A very muted yellow that is probably the hardest color to see in this section. I wouldn’t say it’s very good at imitating its namesake, but it does cover decently. I would still have a hard time trying to find a place to use it. Almond – Not a dead ringer for either of the colors I associate with the nut, this Almond color much more resembles the off-white inside than the brown outside. In the end, though, I’d probably call it a very white yellow, perhaps an “eggshell”. The consistency (and thus the coverage) is very smooth and the uses are very interesting: cream, or eggshells, or sun-bleached something (paper? ), but it’s subtle enough that it likely won’t be used to its full potential. Yellow – Another one of the classics, plain yellow is a surprisingly deep and saturated yellow. The coverage is very good, and the shade is only slightly unnatural. It works well for many flowers (dandelions, sunflowers, etc.) and summer clothes, though on its own it is a little overpowering, and it needs to be augmented with other yellows. Laser Lemon – High in my category of less-than-favorite is Laser Lemon, a particularly hard-to-see shade of slightly-neon yellow. It’s nearly transparent and the coverage is hard to discern but I’d say it’s patchy. It would make an interesting highlight or sign color, but that’s being generous. Goldenrod – Goldenrod is a vaguely gold color that is more like a darker version of the following Dandelion. It’s the darkest/deepest of the yellows and as such is a tad on the messy side and its inconsistency doesn’t help. It’s a useful color for shading, darker flowers, and perhaps older plastics, but I don’t see it coming out often. Dandelion – A bit darker than the flower it’s named after, Dandelion is a nice strong yellow that isn’t particularly pleasant, but also isn’t very yucky. It’s got great coverage but the layer has some inconsistencies and darker patches. It still looks fairly natural and is easier on the eyes than many yellows, making it good for large patches of the color, bees, flowers, and many human-made items like raincoats. Banana Mania – This one sounds like a disease from a comic book, and is a much more orange/peachy color than one would expect from a “banana”. In fact it would work well for small fruits like apricots and peaches in their various forms as well as skin tones, though not as well, since, while it does cover well, it covers unevenly. Unmellow Yellow – Like Laser Lemon but a bit more yellow and less neon, Unmellow Yellow has a terrible name that doesn’t really evoke a color in my mind. This one is hard to see, and hard to find uses for, looking both unnatural and unlike many man-made objects. The best I can come up with is yellow on TV/computer screens and the like. It does almost look like it’s glowing with its decent but incomplete coverage. Sunglow – The name here is a semi-accurate description for this morning-ish orange color. It’s very light, almost fluorescent, and covers quite poorly, but it is a good rising/setting sun or hot coals kinda color. Atomic Tangerine – These names aren’t getting any easier for me, but this one is apt. This color has minimal coverage and a “neon” quality, but it is actually dark enough to see on the paper and would be vaguely reminiscent of a tangerine that happened to get irradiated. Low sunset or safety vests is about all I can think of here. Macaroni and Cheese – I’m gonna call this one flat wrong, and if you have macaroni and cheese that looks like this it might be tasting a bit funny. This slightly brownish orange covers quite well but I have a hard time placing it. Maybe those orangish brick buildings or left-out grapefruit peel. Neon Carrot – Very similar to Atomic Tangerine and perhaps a little on the light side for its name, this color has passable coverage and is hard to see, being both very light and lacking that punch the other neon colors have. Its uses are very limited and it just seems to lack purpose. Outrageous Orange – A real safety vest color, this one has quite poor coverage and high shading, making getting an even “coat” almost impossible. It is a neon-ish color and would do well as the tape used by surveyors or blended into a sunset, but it lacks a natural look. Yellow Orange – Indeed, a slightly lighter and unpleasantly toned orange, this color is like a more saturated “Macaroni and Cheese”, with coverage being fine, but spots of unevenness. It could in some cases be used for citrus fruit, but I think its best use would be for fossilized amber. Vivid Tangerine – A light, almost neon, Orange, Vivid Tangerine looks slightly like the fruit it’s named after, and might be nice for things such as mangos or apricots. It does cover pretty well, but has a lot of variation in the color. Orange – One of the last classic colors, orange is a nice deep… orange that is a bit off for the fruit but works well for most man-made items that are orange. It’s got nice, even coverage and is generally pleasant to look at. Mango Tango – Closer to a pinkish-red than to anything related to mangos this color is similar to that of many fruity drinks and some artificially flavored candies. And it’s got decent coverage with a bit of splotchyness. Red Orange – Aptly named Red Orange is a very reddish orange color (in fact, mostly red) that has okay coverage with some intensity variation. It’s a bit dull but probably a more apt representation of the many red things we have like fire trucks and extinguishers. Sunset Orange – A little brighter than Red Orange, this color shares many of the same attributes as that color, but, as the name suggests, it might be more applicable for sunsets and hot embers. Tan – Well-named, but a bit darker than one would expect, Tan is a pleasant lighter brown that covers well and is fairly even. It’s a good rock or dirt color, and can give variety in wood color when mixed with other browns. Peach – While not looking much like a peach, this very light, orangeish brown does look like the peach we associate with skin or peach ice cream. It’s got pretty good coverage and is one of the few acceptable skin tones in the whole lineup. Melon – This very faint color has hints of brown and red, but could pass for the color of a watermelon if you squint. It wouldn’t be the most apt representation in the set, though. Coverage is less than average, and there isn’t much variation. It works as a good highlighter color to mix in with reds or browns, and might make a good color for Martian dust. Apricot – Looking more like an apricot than Peach looks like peaches, Apricot still doesn’t resemble its namesake very much, but is also a good skin tone. It’s quite faint and the coverage is sub-par, but it does looks quit realistic (for “white” skin) and it can serve as a nice highlight color. Tumbleweed – As a person who grew up around tumbleweeds I can’t really sat this color is accurate, but it is a nice dusty brown with a hint of “gold”. The coverage isn’t the best but that adds to a dirty aesthetic and means the color works very well for dust, dirt, and dried plants. Desert Sand – Being a very light and pale brown that doesn’t cover perfectly and has a little bit of variation means that this color does indeed look very much like (dry) sand and it would do equally well as dust in the wind. Burnt Sienna – I don’t really see the comparison to the name here, it just doesn’t “pop” enough, or feel really “burnt”. It’s just a light-ish brown with the tiniest hint of red that doesn’t cover too well and is mostly useful as an additional wood color. Raw Sienna – More sepia than sienna, this color is a washed-out brown that covers nicely and would be good for old-timey photographs or dirt that’s on the dryer side. Mahogany – Similar enough to the wood to get a pass from me, Mahogany is a deep reddish brown with decent coverage. It works great for old, faded barns and bricks, while sometimes being useful for variations in wood tones. Fuzzy Wuzzy – If Fuzzy Wuzzy was a purplish brown bear then this color’s name would be accurate. It’s almost like the color of the teddy bear from Toy Story after it’s been through a few too many washes. It covers well-enough and can be used wherever you need a dirty, faded purple. Chestnut – A deep brown with a touch of purple, Chestnut isn’t quite like the nut or the wood, but it does make a good color to add into a set of woods, or perhaps as a very dark wine. The coverage might be a little lacking for that, though. Beaver – A dark grey with a subtle hint of brown, the name of Beaver here is irrelevant, but this is a very good color for asphalt or faded tire rubber. It’s helped here by the good coverage, with some variation in there. Sepia – Much darker and more traditionally “brown” than I usually expect, this Sepia has some good coverage but because of how dark it is it shows up much more than other colors. It makes a good wood or dirt color, but probably isn’t the right choice for old photographs. Antique Brass – Closer in my mind to dull copper, this brown is slightly metallic and covers decently enough, but looks very flat. Unfortunately it would probably work best as a dirt or bark color, and not as a metal object. Copper – Surprisingly, even though it’s metallic, this is the only brown color in the set I’d really consider close to a skin tone. It’s a lightish brown with some very good coverage and some nice variation. It could work as a metal, but I’d stick to skin or wood with it. Gold – Always a hard color to make, this Gold looks like a worn and scuffed version of the metal. And it’s got good coverage, but it doesn’t quite make it. It’s not the best representation, and it’s more akin to less-copper brass, but it’ll do for that and not much else. Silver – A shiny lighter grey, silver has good coverage, a lot of variation, and plays the part of a generic metal quite well, though I wouldn’t say it’s very good for silver, it’s closer to steel. Timberwolf – I like the name, and this pale, warm grey does resemble some types of wolves (some times). It’s not got the best coverage, but some variation in there makes it good for fog or sleet. Grey – On the darker (and cooler) side of grey there is… Grey, which has decent coverage and decent tone. It works quite well for concrete, ashes, or shadow. Shadow – On the other hand, Shadow doesn’t work well for shadows. This warm, mid-tone grey is a very strange color that I really can’t place. It’s almost like it has a bit of green in it too. The coverage is fine but the variation makes things a bit stripy and weird. Black – And now for the final of the classic 8 colors, Black isn’t as dark as I remember it being, and it does have problems with coverage that I do remember, but it is the darkest crayon here, and it works well for nighttime, shadows, writing, and just being an antithesis for white. Sharpener – The Sharpener that was included in my package is a fascinating little (it’s not very little, actually) thing. It’s a 4 ½” tall statue of the character “Tip”, who is an anthropomorphic crayon. The tip of the crayon here is the sharpener, which is all plastic. The given hole is much larger than the crayons provided, but the “blades” do sort of self-index toward the center as you insert the crayon. Rotating the crayon with a little pressure does effectively shave off the sides of the crayon until there is a cone of about the same length as the factory crayons, and an equally blunt tip. It works easily and smoothly, and all the shavings are stored inside until you remove the top bit (just above the character’s eyes) and dump them out. And there we have it, the 120 crayon Crayola box. Is it worth it? For the price, sure, it’s quite inexpensive, but the colors leave much to be desired. And while I do think a child’s bragging rights are worth something, as far as making art goes, this set is unnecessary. Crayons (of the school variety) are imperfect tools that are hard to make art with already, and many of these colors are useless on their own while being unable to really mix with any of the other colors. It just doesn’t really help that much, and kids can easily become overwhelmed with choices (they’ll basically either just use the same crayons they would get in smaller packs until they’re gone or use any “green” as green). The sharpener is neat, and having a bunch of crayons around is “cool” (I think it’s cool… maybe “fun”), but I don’t see a significant upgrade here from the 48 or 96, especially since there are a few manufacturing defects regarding the paper wrap, holes in the crayons, and receiving duplicate colors. But also it’s like $7 and I can’t tell you how to live your life. Well, this series has taken me much longer to get out than I anticipated, but we’re in the final stretch with the last 30 colors (and the sharpener). Let’s take a look. Are regular crayons too small for your hands or prone to rolling off your table and getting all over the floor? Don’t worry, Crayola has your back with triangular crayons that “promote proper writing grip” and are “anti-roll®” (that registered sign isn’t a joke by me, it’s actually on the box). They are available in your standard pack of 8, or, as in my case, 16 (and maybe larger packs, but I can’t find any), and I’ve been seeing them pop up in stores recently*. But are they the right fit for you? From what I can tell, the colors here are exactly the same as in all other Crayola crayons so I won’t be going over them here (Colors–Review). The pack comes in a standard cardboard box (a little rough around the edges) with a cardboard tray inside and two plastic dividers to hold the crayons in place. It’s a pretty sturdy system and none of my crayons were broken or significantly worn. The bodies of the crayons themselves are quite a bit larger than your average crayon, being triangular in shape (with rounded corners) with each face being just shy of a half an inch wide. They’re wrapped with a craft-paper-esque standard Crayola wrapper and have a step down about a half-inch from the front followed by a triangular point. From the box they are super comfortable, resting nicely in the hand with the paper being both warm-feeling and giving enough friction to prevent the hands from slipping. They work well both for children without fine motor skills and adults with larger hands (though the grip is actually surprisingly small). And they perform just as well as any other Crayola crayons (that is to say, very consistently and pretty good for a wax crayon, but not much use for blending or layering). I’d say the gimmick works, if you (or whoever you’re buying them for) were having problems with regular crayons being uncomfortable, held wrong, or in a constant state of rolling off the table. They are a fairly inexpensive solution, though that shows: imperfections in the wax mixture and paper application are readily apparent (with several noticeable chunks of crayon missing in some places). Maybe that’s just my pack, maybe Crayola’s manufacturing standards are going down, or maybe they were always like that and I didn’t notice. In any case, they are effective in design for both children and adults, and probably worth the little extra cost in crayon mass alone. *Despite the fact that I peruse office/art supply aisle frequently I miss things just as frequently, so they might have been there before. This is part 2 of my review of every single color in the Crayola 120 crayon box. I’m going to be taking a look at some purples, the blues, and some greens. In case anyone was wondering, the colors are roughly sorted so that they flow as smoothly as possible from one color to the next, although this is trumped by the wrapper color. So even if I think it’s more red, if it has a purple wrapper it went in the purple section. And now, let’s begin. And that’s part 2, looking at the second group of 30 colors from the 120 Crayola crayon box, next time it’ll be another 30. A ‘china marker’ or ‘grease pencil’ is essentially a hard, fat crayon that is used mostly for temporarily marking nonporous surfaces like glass, plastic laminate, tile, etc. They are an item that used to be pretty popular but have since waned as newer products like dry erase markers for temporary work on board or laminate, and permanent markers for less temporary weather resistance have come on the scene. Yet they still can be very useful when working with glass or porcelain. This being the case I was not surprised to see some in the hardware store, but I was slightly surprised to see that they were ‘Sharpie’ brand. Do they hold up in comparison? The short answer would be “yes”. The Sharpie brand here is just an addition to an older, very standard design by Sanford. The body is just a version of their “Peel-Off” design. I have a fairly old (by surviving china marker standards, since using them destroys them) one that is almost identical in most ways. The body is tightly wrapped brown-ish paper that is sealed with a black, perforated coating. On this coating is all of the relevant information of the product, and beneath it is a small white string. Pulling on this string will create a tear in the coating that can then be used to tear off enough of the inside material to expose the tip if it is worn down. The tip begins exposed with a roughly conical spiral of the paper that provides a nice template when tearing off a bit later. While I do suppose that the item could be sharpened, it would be pretty wasteful and difficult which is why a system like this was developed. As for writing, I have a black version, and it behaves very similarly to a fat crayon. Line width and coverage are dependant highly on how much pressure is applied, but it almost never is a true “line” in that it doesn’t fill in the whole space when writing. It writes well on nonporous surfaces and often on porous ones, being again about as smooth as a crayon. For what it’s intended to write on it is relatively weather-and handle-proof (it can smear) but can be removed with a paper towel and some elbow grease. Nonporous surfaces are a bit more tricky, but in general there is a way to clean it off. 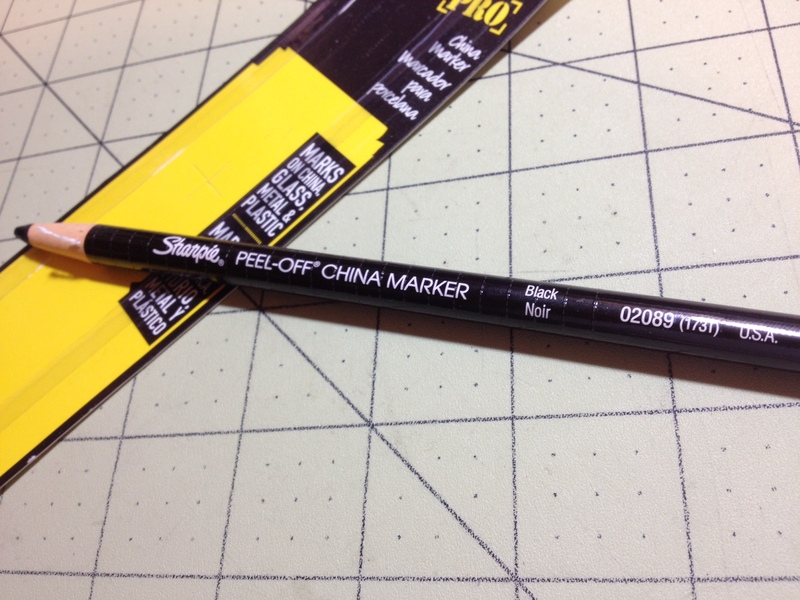 There are only two types of grease pencil/china markers: the mechanical version, and peel-off versions, this one being the latter. 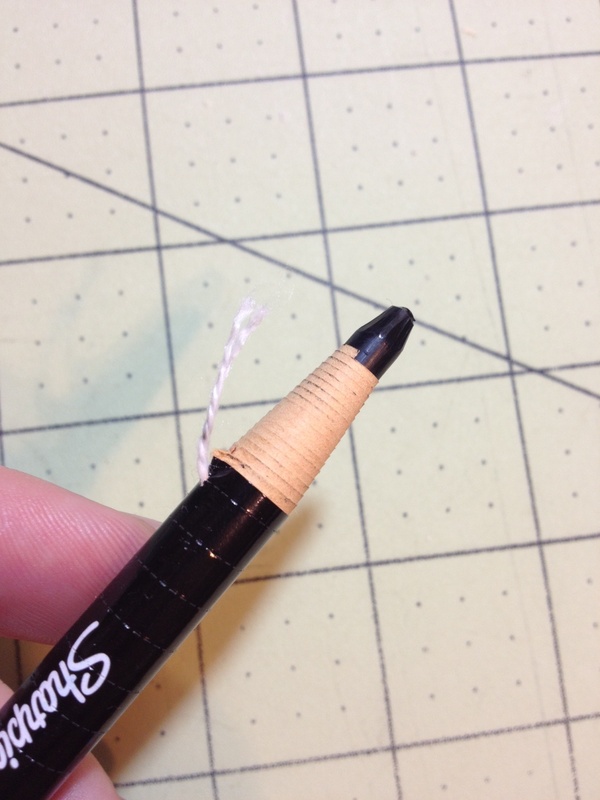 It is very hard to mess up a peel-off grease pencil, but it is also hard to innovate in that field. This shows neither. It was competently made, but not entirely ingenious. It lacks any innovation or improvement over the pervious generations, but it does mark what it was meant to mark (china) and more. The price and availability are also quite reasonable. If you desire to acquire a china marker, and don’t mind the fact that the “greasy” (waxy) tip is exposed, then this one will do everything you want it to. They’re simple and sturdy, with just a traditional paper wrapper that is almost instantly recognizable to anyone who was raised in the United States. They’re harder to make a mess with than markers and easier to use than colored pencils. Still, they don’t lend themselves well to more advanced techniques, like any type of blending really. But to solve that, Crayola has a (relatively inexpensive) box of their 120 “standard” colors (excluding metallic, sparkling, and retired colors) available to give you as many different shades as you need. I roughly organized this set and split it into 4 parts of 30 crayons each. Where I will go through and evaluate each color and whether or not getting the 120 is really that much better and the 64 or 96. And that’s all for the first 30 colors. Next time I’ll look at another 30 going from the purples to in the greens. 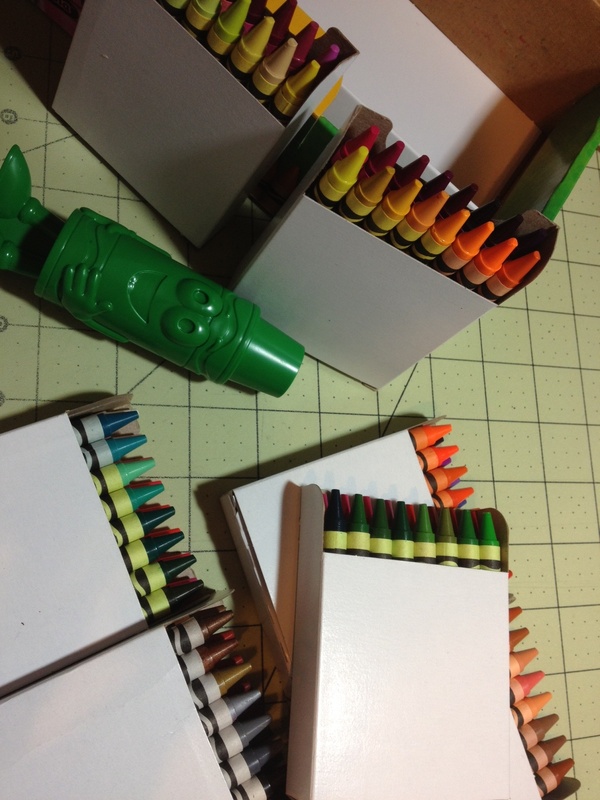 Now, crayons are impractical for most art types, usually because they are fragile and fiddly. What if these two problems were fixed, and crayons were easy to take and use anywhere? What would their value be? 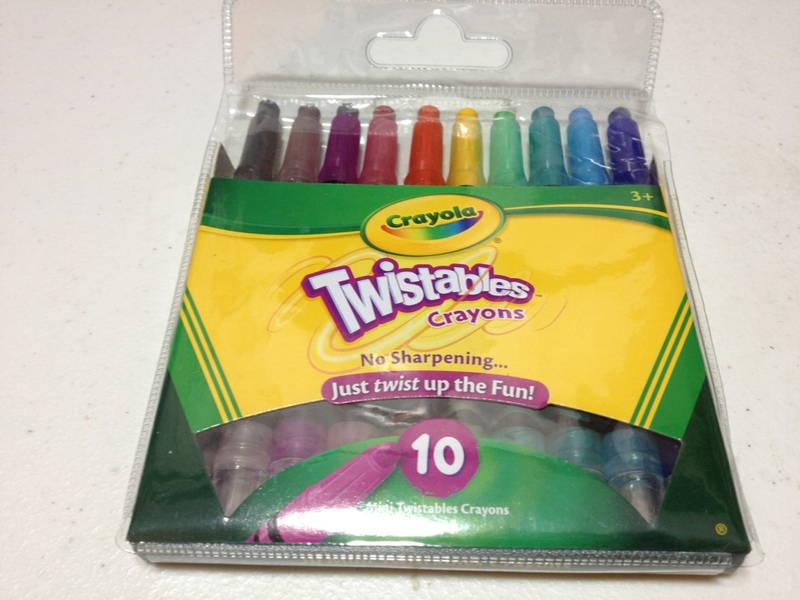 Well, Crayola has a set of twistable crayons which have plastic bodies with a twist action, so let’s take a look. First off, the crayons come in a quite nice plastic-and-card-stock carrying case, which, while handy, seems like it would fall apart rather quickly. And, just for me personally, I would want to store these somewhere else, but have a problem throwing plastic things away so I keep them in it. 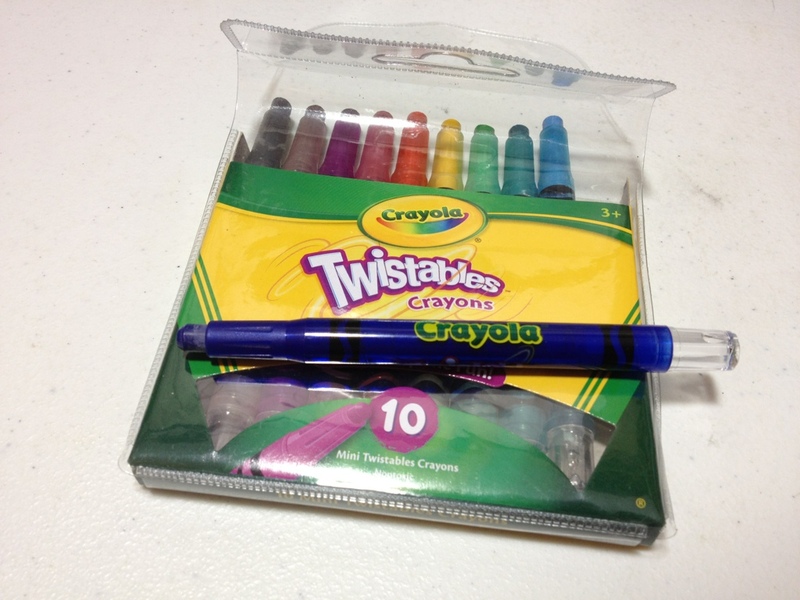 The crayon barrels are made of plastic and have Crayola and Twistables written on each one, with no indication as to color, though the body is see-through so the color is fairly apparent. Near the tips is a tapered and grippy section which works quite well, especially since the rest of the body is very slick. At the other end is a twisting knob which operates easily and can be used to both push the crayon out and retract it. That’s almost all there is to say. The crayons themselves are nothing special, they’re just kept in place by a plastic tube and screw. They are, of course, for kids so they are bright and not very natural. They are also non-toxic, which is a bonus. They stay alright on the paper, but not as well as more “professional” crayon and oil pastels. So, overall they are better crayons, but they don’t change what Crayola crayons really are. Which is good for the people who use Crayola crayons. They aren’t particularly serious art supplies, and that’s fine. For more advanced things I’d recommend picking up one of the larger cases with more colors rather than the standard 10 pack I got. Past that there really isn’t anything special about them.